The plant body is sporophyte. It is an evergreen tall tree. Plant body is divided into root, stem and leaves Stem: The main trunk is unbranched. It has branches confined to the apical region. These branches form a characteristic canopy. It is covered with a scaly bark. Its branches are dimorphic. (a)Branches of unlimited growth: The main branches have an unlimited growth. They bear only scale leaves. (b)Branches of limited growth: Branches of limited growth or dwarf branches are produced in the axil of the scale leaves on the main branches. These are about I -2cm long. These are covered by one or two scale leaves. These branches also bear foliage leaves. A dwarf shoot with its foliage leaves is called spur. 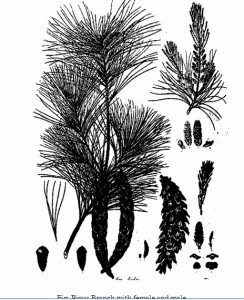 Leaf: Pinus has two types of leaves: scale leaves and foliage leaves. (a) Scale leaves: The scale leaves are small, membranous and brownish in colour. These are protective in function. They are present on the main and dwarf shoots. (b)Foliage leaves: The foliage leaves are green and needle-like. They are found only on the dwarf shoots forming the spur. Roots: Pinus has a well developed tap root. It remains short and grows on hard ground or rocks. The lateral roots are well developed. These roots spread over a large area. Young roots are infested with a fungus to form mycorrhizae. Stem is differentiated internally into epidermis, cortex, vascular tissue and central pith. 1 Fnidermis: The surface is covered by an epidermis. It consists of a single layer of cells. Outer walls of these cells are highly cutinized. Below the epidermis is a hypodermis which is formed of layers of lignified cells. Cortex: The cortex is formed of parenchymatous cells. Cortex has a large number of resin canals. Each resin canal is surrounded by a layer of resin secreting glandular epithelial cells. side. A narrow strip of cambium is present between xylem and phloem. Pericycle is present outer to the ring of vascular bundles. A single layered thin walled endodermis is present outside the pericycle. Secondary growth takes place by the activity of cambium ring. There are distinct annual growth rings in the wood. 4. Bark: Phellogen originates in the deeper layers of the cortex. It is present in the form of strips. It produces characteristic scaly bark. Epidermis: Leaf is covered by thick walled epidermis. Epidermis is covered by a thick layer of cuticle. Sunken stomata are present below the general surface. Two or three layered hypodermis is present underneath the epidermis. Hypodermis is composed of sclerenchymatous tissues. This hypodermis is the main strengthening tissue of the leaf. 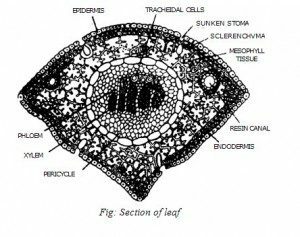 Mesophyll: The mesophyll of the leaf is parenchymatous. It is not differentiated into palisade and spongy parenchyma. Resin canals are present below the hypodermis. Each resin canal is lino by a layer of small epithelial cells. Each leaf is supplied by tw unbranched veins. 3. Endodermis and vascular tissues: Endodermis is present outside the pericycle. Pericycle surrounds the xylem. Pericycle is formed of parenchymatous cells. Its cells adjacent to the phloem are called aluminous cells. The cells adjacent to the xylem are called tracheidal cells. These specialized cells form the transfusion tissue. They help in the lateral flow of nutrients. young root is di- to pentarch. Xylem bundles are Y-shaped. Siwtil parenchymatous pith may be present or absent in the centre. The ring of vascular bundles is surrounded by two to three layered pericycles. Pericycle is surrounded by endodermis. The cortex consists of a few layers of thin walled parenchymatous cells. Root lairs may be present or absent. Roots may be covered by lycorrhizal fungus. Pinus is me ,oecious. Plant develops both male and female strobili on the same plant. The strobili are monosporous. There is no vegetative reproduction in Pinus. The male cones are much smaller. They are produced in :lusters near the tip of the long shoots. The male cones are produced in the spring. Each male cone has a central axis. It bears a nua Der of spirally arranged microsporophylls or stamens. Each microsporophyll has sac like microsporangia (pollen sacs) on the ventral side. Each microsporangium produces a large number of microspores (pollen grains). 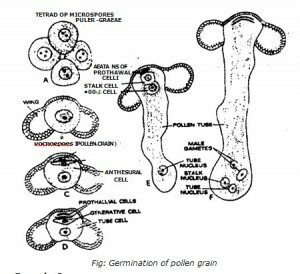 The wall of each microspore (pollen grain) consists of an inner Milne and an outer exine. It has balloon like wings. The wings help in the dispersal of spores by wind. the repeated divisions. The peripheral cells of the archesporium form the tapetum. 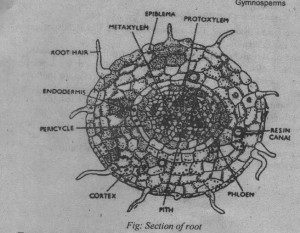 Some of the archesporial cells are transformed into microspore mother cells. The remaining archesporial cells and the tapetal layer provide nourishment to the developing microspore mother cells. The microspore mother cell divides to form four microspores or pollen grains. The exine of spore forms wings. The pollen grain divides in to smaller and larger cells. The smaller cell again divides to form two small prothalial cells. The larger cell becomes antheridial cell. The sporangium splits and microspores are released from the microsporangia at this stage. Female cones are produced in the axils of the scale leaves. The production of female cones is initiated in the winter. These become ready for pollination during the following spring. Each young female cone has a central axis. It bears spirally arranged scales. The scales are of two types. Some are thin membranous and are directly attached to the central axis. They are called bract scales. Woody ovuliferous scales are present on the ventral surface of each bract scale. The broader end of the ovuliferous scale has projection called the umbo. Each ovuliferous scale bears two ovules. They are situated side by side on upper side. 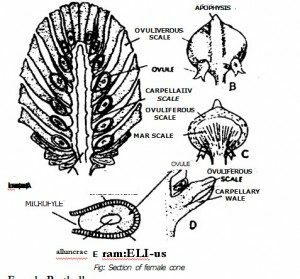 Each ovule (megasporangium) has a mass of nucellar tissue. They are surrounded by a single integument. The micropylar end of the ovule is directed towards the central axis. A single megaspore mother cell is differentiated in the nuc,ellus near the micropylar end. This megaspore mother cell undergoes meiosis to form four megaspores. Only the lower most megaspore remains functional. The others disintegrate. Functional megaspore (embryo sac) increases in size. It occupies the major part of the nucellus. Pollination takes place at this stage. The megaspore divides many times to form female prothallus. Megaspore wall encloses the female prothallus. Three archegonia are produced towards the micropylar end. 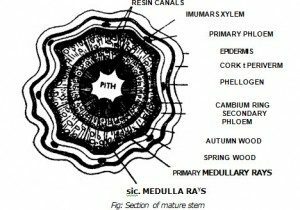 Each archegonium develops from a single prothalial cell. Archegonia consist of a large venter and a short neck. The oosphere or egg is very large. It is bounded by the prothalial cells. There is a small ventral canal cell below the neck. The neck is without any neck canal cells. The prothalial tissue enlarges very much in size. It crushes all nueellar tissue except a small amount near the micropylar end. Each ovule secretes a mucilaginous drop at the micropylar end. A gap is produced between the ends of the ovuliferous scales. It forms a passage for the entry of pollen grains. Wind carried pollen grains. The mucilage drop entangles the pollen grain. Pollen grain is carried through the micropyle to the surface of the nucellus. The pollen grain has two prothalial cells and an antheridial cell. These cells soon disintegrate. 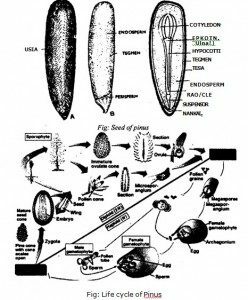 Further development of the pollen grain takes place at the surface of the nucellus. The antheridial cell cut off second prothalial cell. It also cut off generative cell adjacent to the prothalial cells. The remaining large cell is known as the tube cell. Its nucleus is called tube nucleus. Tube nuclers controls the growth of the pollen tube. 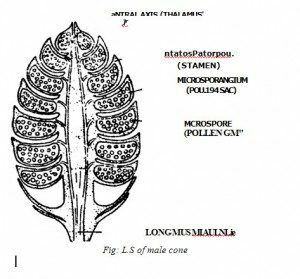 Exine of the pollen grain ruptures. Intine grows out to form the pollen tube. It grows through the nucellus. But its activity stops till spring. Female cone enlarges very much in size after pollination. Outer ends of the ovuliferous scales increase very much. They meet each other to close the gaps in between them. The cone is covered with a lot of resinous secretions. The pollen grain resumes its activity in the spring. Generative cell divides into two cells: stalk cell and a body cell over the stalk cell. Body cell divides into two unequal male cells or sperms. Male cells pass down to the tip of the pollen tube. The pollen tube grows through the nucellus. It passes through the neck of the archegonium and touches the oosphere. 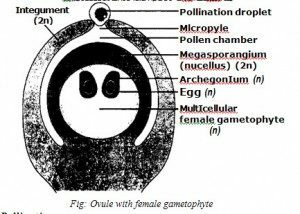 One male nucleus fuses with the oosphere to form oospore. The other degenerates. Fertilization is completed in the June of second year. cells. The four embryonal cells separate from each other. Each develops into a separate embryo independently. Each embryonal cell forms secondary suspensor cells. The formation of more than one embryo from a single fertilized oosphere is called polyembryony. Only one embryo reaches maturity. The rest are aborted. Suspensor cells: The cells of the middle tier become suspensor cells. Suspensor cells elongate very much. It pushes the developing embryos into the prothalial tissue for nutrition. Rosette cells: The cells of the upper most tiers are called the rosette cells. These cells do not take part in the development of the embryo. A fully developed embryo is in the form a short straight axis. Its radicle is present towards the micropylar end. Plumule is present towards the inner side. Plumule is surrounded by ten cotyledons. The unutilized prothalial tissue forms the endosperm. The persistant nucellus tissues near the micropylar end form the perisperm. The integument becomes hard testa. Some part of the ovuliferous scale fuses with the developing seed. It makes a large wing for dispersal of seed. The axis of the female cone rapidly increases. It produces gaps in ovuliferous scales. The cone becomes woody for the dispersal of seeds.